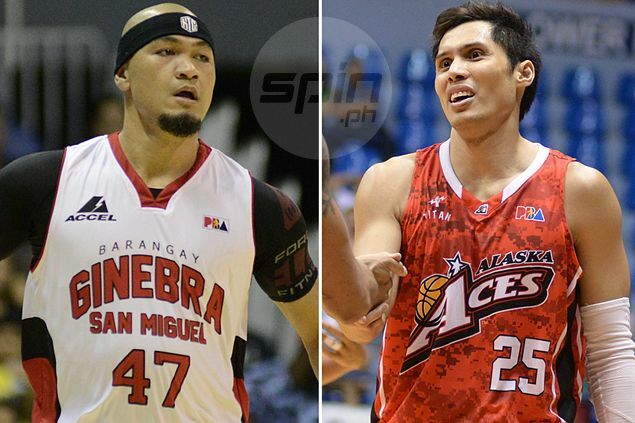 PUERTO PRINCESA - Injuries will prevent Barangay Ginebra superstar Mark Caguioa and rejuvenated Alaska gunner Dondon Hontiveros from playing in the PBA All-Star Game over the weekend. According to team insiders, an MRI scan done by famed orthopedic surgeon Raul Canlas on Caguioa revealed an injury that will require the 35-year-old high-scoring guard to take a longer rest and skip the midseason classic. “He has a serious back injury. We can’t reveal the true extent pero it will require him to rest a few more days, maybe a couple of weeks more,” said the team insider who requested anonymity. Ginebra officials have yet to advice the Office of the Commissioner regarding Caguioa’s non-participation in the much-awaited spectacle, where he was voted by fans to start for the North All-Stars. “Wala, hindi na siguro kakayanin. Kasi si Doc Canlas na ang mismong nagpigil sa kanya. Mark wanted to go, but he can’t go against the advice of his doctor. Baka lumala pa,” said the source. With Caguioa out of the game, the PBA might tap Ginebra teammate LA Tenorio to take the spot of Caguioa since the former Ateneo star will be in this southern city to participate in the three-point shootout. Former PBA vice-chairman and now NickelAsia vice-president for corporate affairs JB Baylon said it was unfortunate that Caguioa will be sitting out the game, saying Caguioa is one of the most popular players among Palawenos. “Sayang, he can’t come,” said Baylon, who spearheads the corporate social responsibility programs of NickelAsia’s Palawan-based companies, Rio Tuba and CoralBay Nickel. Baylon said he is still hoping Caguioa will be part of the delegation flying in on Wednesday morning. “If he can still come, kahit he won’t play, and his doctor gives him a go-signal, we would be glad to have Mark join us in other activities of the All Stars,” he said. Meanwhile, Hontiveros will miss out on the All-Star game owing to an ankle sprain that also kept him out of Alaska’s game against the KIA Carnival on Tuesday night. “Wala bro eh. Di ko kaya maglaro. Hindi nga rin ako nakakapag ensayo. Mamaya nga sa game hindi rin ako pwede. Medyo hindi kasi maganda yung pamamaga ng paa ko,” Hontiveros said. A 12-time PBA All Star, Hontiveros said he feels bad to miss the annual event. “Ayaw ko nga sanang ma-miss eh kasi alam ko hinihintay rin tayo ng fans. Kaso hindi talaga pwede, kaysa naman iika-ika ako sa venue. Nakakahiya lang,” he said. “Anyway, nagpapasalamat ako sa mga fans na bumoto sa akin pati na sa mga PBA coaches na naglagay sa akin sa South team. Pasensya na po, babawi na lang ako next year, kung mabibigyan ulit ng pagkakataon,” added Hontiveros. No replacements are necessary for Hontiveros since the South lineup has 13 players including the retired Jimmy Alapag, who has been given the chance to play in his farewell game.